Lakeridge Winery & Vineyards first popped into my life about 25 years ago. I drove each football weekend for many years from Orlando to Gainesville to watch the Florida Gators. In 1988 I noticed their beautiful Spanish style building under construction west of the turnpike north of Clermont. They opened for business not long after that in February 1989. This comfortable place has become a very popular Orlando area attraction for tourists and residents alike in the years since they opened. 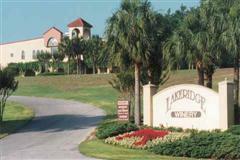 The beautiful main building and vineyards are on a 127-acre estate in the hilly country about 25 miles west of Orlando. Before the great freeze of 1982, these hills were covered with citrus groves. The vineyard takes up 77 of the 127 acres, and includes Florida hybrid bunch grapes and varieties of Muscadines including Noble, Carlos and Welder. Research on new varieties continues to be done in the vineyard. The staff engages in research along with the Florida Department of Agriculture. 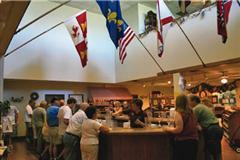 The winery has a large tasting room and a wonderful gift shop. Several types of wine are sold under the Lakeridge brands. These wines can be purchased at many retail outlets in Florida. They are also set up for people interested in buying wine online. In addition to all of their wines, the gift shop sells gourmet foods, cheeses, crackers, sauces and wine accessories. They can also put together one of the finest wine gift baskets in Florida. Surprise your friends with a nice gift basket. There are probably more events held at this establishment than any of the other Florida wineries. All year long there are arts and crafts shows, jazz concerts, harvest festivals, grape stomping events, vintage car shows and vintage music events. Complimentary tours and wine tastings are offered seven days a week. This is a fun place to visit even if you don't drink wine. The facility is also available for corporate parties, wedding receptions or any special occasions or events that needs rented space. From Orlando, take the Florida Turnpike North to Exit 285. Follow the signs to Lakeridge Winery and Vineyards. From Ocala, take the Florida Turnpike South to Exit 285. Follow the signs to Lakeridge Winery and Vineyards. From Tampa, take I-4 east toward Orlando. Exit at US-27 and drive to about 6 miles north of Clermont. The winery is on your left. For information about special events, call 1-800-768-WINE.